Chula Vista gets its name from its scenic location, meaning beautiful view in Spanish. It is just 7.5 miles from downtown San Diego and the U.S.-Mexico border and stretches from San Diego Bay to the mountains, totaling 52.09-square-miles. For visitors, the east side of the city is highlighted by various shopping centers, parks, hiking trails, two public golf courses and the U.S. Olympic training center. The city’s westside will be at the forefront for the next 20 to 25 years with the Chula Vista Bayfront Master Plan, helping drive the city’s economy with new construction for residential and commercial use. 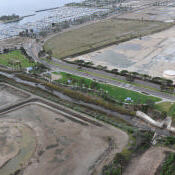 Approximately 550 acres of the city’s waterfront will be transformed with three hotels; a conference center; 1,500 multifamily housing units built by Pacifica Cos.; two RV parks; restaurants; a mix of office and commercial buildings; and 238 acres of open space that will include 130 acres of public parks, trails and bike paths, and buffers that will protect sensitive habitat. This city is the second-largest in the county behind San Diego, and celebrated its centennial in 2011. Chula Vista features a vast array of visitor attractions, like a concert venue and an Olympic training center. The city continues to grow with economic drivers, such as new housing communities and the redevelopment of its waterfront.